Nothing — and I actually mean nothing — in this world gives me a confidence boost quicker than a fresh, bouncy blowout. I could be rocking a groutfit with a fever and body sweats, but as long as my hair looks like a million bucks (or, precisely $45 plus tip), I feel brand-new. My bank account, on the other hand, isn't quite so hyped. Until recently, I had no faith in the possibility of mimicking a salon-caliber blowout in my own bathroom. But thanks to the Dyson Supersonic™ hair dryer featuring the fastest motor around, this tutorial had me changing my tune. Don't believe it? Press play on the video above to see how to recreate a blowout that rivals your hairstylist's handiwork — and pocket that $45 plus tip for your next mani-pedi. Step 1. Mist a leave-in conditioner all over damp, towel-dried hair. Step 2. 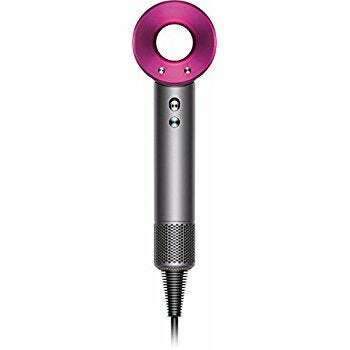 Using your Dyson Supersonic™ hair dryer and the smoothing nozzle attachment, begin rough drying hair all over. Step 3. Next, separate the top portion of your hair and secure with a clip. Step 4. Using a round boar-bristle brush, curl the side section of hair underneath towards your head, then apply heat all over with the styling concentrator attachment. Pro tip: The dryer's intelligent heat control feature (which temperature checks every 20 seconds) helps shield hair from extreme heat and protects shine. Step 5. Once the section is dry, gently unravel hair, twisting in an outward motion to avoid tugging or pulling. Step 6. Repeat this step on each section until hair is completely dry. Step 7. Give hair a quick tousle to add volume, and you're ready to go. For even more hair inspo — including hair tips, tricks, and more — check out these stories curated in partnership with Dyson.